Introducing Pivoboard—A Scrumboard for Pivotal Tracker! 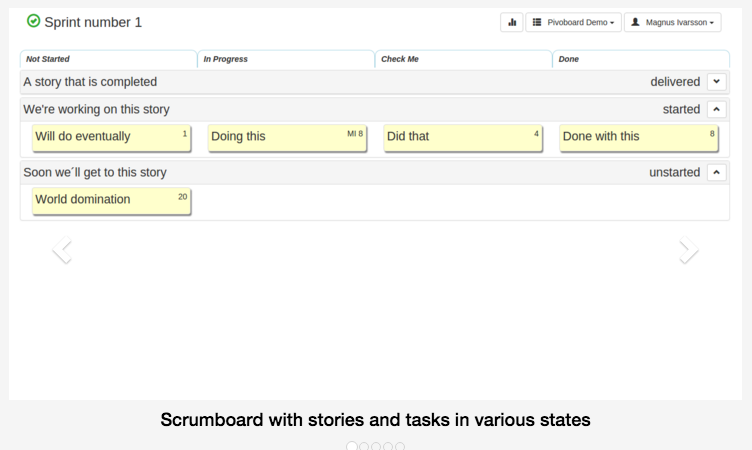 Pivoboard is an extension to Pivotal Tracker that adds an online scrum board that’s always in sync with the project. Pivoboard uses the existing task metadata that Pivotal Tracker offers and adds some more in the task description field. This metadata is visible for all Pivotal users and can be edited by hand if needed. The additional metadata is also used to produce a burndown chart of the sprint tasks using the estimated hours. The pricing is based on the the number of activated users per project and month, payment via PayPal. One free demo month trial is given.